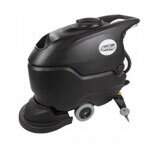 The Viper 32T factory floor scrubber requires 2 separate squeegees on the back of the machine in order to vacuum up solution as you pass along the floor. This polyurethane blue one fits on the front of the squeegee apparatus and is different in design than the Fang 32T rear replacement squeegee. This polyurethane squeegee is a good all-around blade because it is resistant to oil, gasoline, and other chemicals.